The late Tom Bingham, perhaps the most distinguished English jurist of his generation, noted that legal scholars trace the concept of rule of law back to Aristotle. However the concept is apparent, at least in nascent form, in Sophocles’ Oedipus the King written a century earlier. In this the king realises as his own investigation finds himself responsible for the plague on Thebes that he must be subject to his own earlier ruling on how the culprit should be held accountable. Bingham built on prior formulations of rule of law to argue that the idea had eight principles that were fundamental to it. These included that the law must afford adequate protection of fundamental human rights, and that the state must comply with its obligations in international law as in national law. For hard Right ideologues, such as Michael Gove, Nigel Farage and Boris Johnson, such ideals of rule of law sit at odds with their own conception of the supremacy of Parliament as a fundamental of the unwritten British Constitution. But generations of parliamentarians have never seen any conflict between rule of law and rule of parliament. So they have, over the past 40 years, set constraints on the unfettered power of parliament, notably in the form of the Human Rights Act, which is administered by the UK’s Supreme Court with appeal to the European Court of Human Rights, and the treaties that the UK freely entered into to obtain its membership of the European Union, which are overseen by the European Court of Justice. So, when Gove, Johnson and Farage talked about taking back control during their poisonous campaign to take the UK out of the EU, what they were talking about was removing the constraints that derive from the treaty obligations which have provided the manifold benefits that arise from EU membership. Doubtless they were also thinking about national law, specifically the protections from government excesses afforded to citizens by the Human Rights Act. It is axiomatic that a partnership like the European Union, indeed any international treaty with other nations, must introduce mutual responsibilities and ideally should have some independent body to oversee that the parties to the treaty comply. Otherwise the already fragile concepts of international rule of law become meaningless. British experience of international rule of law during its colonial period was rather different to such contemporary expectations. It had little consideration of mutual benefits but rather had an altogether more lopsided aspect, with no recourse to independent arbitration or appeals to human rights for the colonial subjects whose exploitation enriched the UK to such an extraordinary extent. This colonial perspective contributed greatly to the ludicrous myth of Britain standing alone during the Second World War. This myth insultingly overlooks the vital contributions made by Africans, Australians, Canadians, Indians, and Kiwis to the struggles against Nazism and Japanese militarism. This myth also gravely overlooks the horrendous cost that this entailed, most infamously in the Bengal famine of 1943. But a theme running through the depressing debates relating to the UK’s EU membership in the run up to the referendum of 23 June was that the UK can still ‘stand alone’. This was underpinned by that weird continuing sense of colonial entitlement: that the UK should be allowed to cherry-pick what its relationship with the EU should be without any appreciation that UK membership should bring responsibilities not just privileges. This attitude was copper-fastened by a careful cultivation of xenophobia by the Leave campaigns, and by a startling disregard for mere facts, from the true cost of EU membership to the actual provisions of EU treaties and the rights and obligations of member states under those treaties. This willful ignorance and misinformation to the UK electorate continues past the result of the referendum. 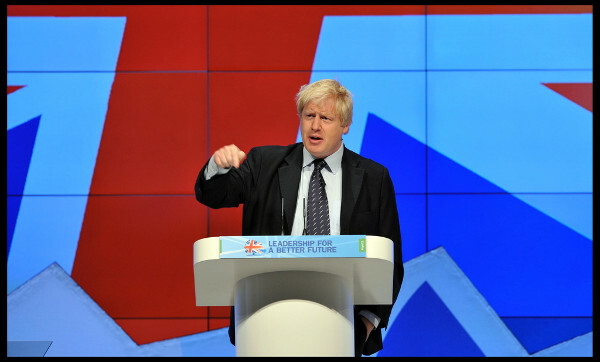 Perhaps Johnson rarely lets facts get in the way of an opportunity to stoke the prejudices of his listeners. Perhaps he is merely supremely uninterested in facts. The European Court of Justice enacts nothing. It administers the body of law agreed by the European Parliament and the Council of Ministers, of which, to date, the UK has been an equal party. It is too early to see what will be all the consequences of the UK’s repudiation of the EU. Perhaps this will sate the appetite of the ideologues of the Right for unfettered power if what comes to pass is a recession-hit Little England as Scotland prepares to steer its own course as a full and independent member of the EU. But it is unlikely. And the Human Rights Act remains for a while longer, another affront to the Tea Party-ist fantasies of a resurgent and exclusivist English nationalism. Gove or Johnson may like to eruditely comment, after Milton, that they prefer to rule in hell than serve in heaven as they seek to translate their peculiar Cromwellian version of Ourselves Alone into a new English polity. Oedipus could not bear to look upon the devastation that he had wrought on his family and city so he tore out his own eyes. Today Gove, Farage, and Johnson look upon the wasteland that they have created of young people’s hopes for modest opportunities to study, work and fall in love among their fellow European neighbours, and they judge that it is good. I have read this article a few times and can’t see what your point is if any. I also can’t see the relevance of the link to the Matthew Collins of Hope not Hate article. Could you explain?